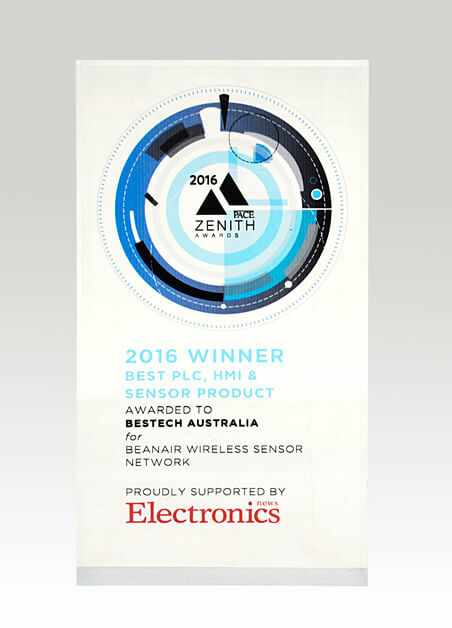 Melbourne, VIC – 11 August 2016 – Bestech Australia has been named the winner of the “Best PLC, HMI & Sensor Product” category at the 2016 Process And Control Engineering (PACE) Zenith Awards. The PACE Zenith Awards celebrate the many successes of the process control and automation industry. Bestech Australia offers many innovative products for process control and automation, and one of them is the award winning Beanair wireless sensor. Structural health monitoring systems are used to detect damage in buildings, bridges, ships, and aircraft. These systems consist of a device that collects and stores vibration measurements from a small number of sensors, which monitor structural response to ambient vibration (wind, passing vehicles) or forced excitation. Wireless sensor networks are a natural candidate for structural health monitoring systems, as they simplify deployment of instrumentation caused by power and wiring constraints. This can cause significant setup delays and limit the number and location of sensors. The Beanair wireless sensor network (WSN) enables real-time monitoring performance and environment. The new R&D project developed an integrated system that allows BeanGateway (data collecting via Ethernet or Modbus) / BeanDevice (wireless sensors: accelerometer, inclinometer, temperature, humidity & light sensor etc.) to operate without an internal battery. The use of WSNs on oil and gas platforms focus on monitoring the production process, to either prevent or detect health and safety issues or to optimise and increase production. Areas the wireless sensor can be used include remote pipelines, corrosion, equipment condition, real time reservoir status and so on.